Christmas blessings from the Sisters! Although Sister Michael Kaliher is no longer with us, her artwork continues to inspire and allows us to feel her presence. 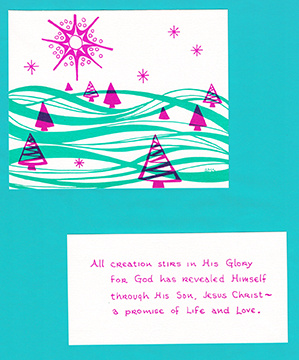 She and Sister Edith Selzler brightened every holiday with their artistic interpretations of Emmanuel, God with us. Here is one of Sister Michael's lovely sketches.